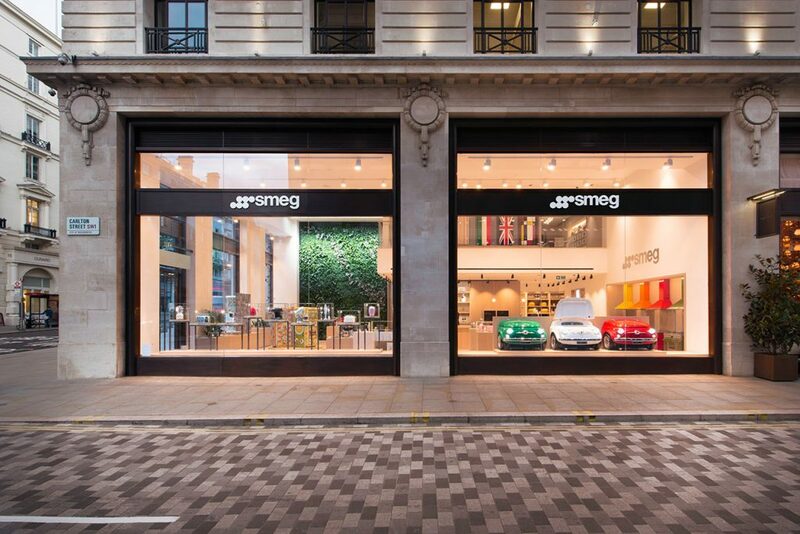 The new Smeg London Store, located in the heart of Regent Street St James and just 150mt from Piccadilly Circus, is a celebration of the very best of “Made in Italy”. 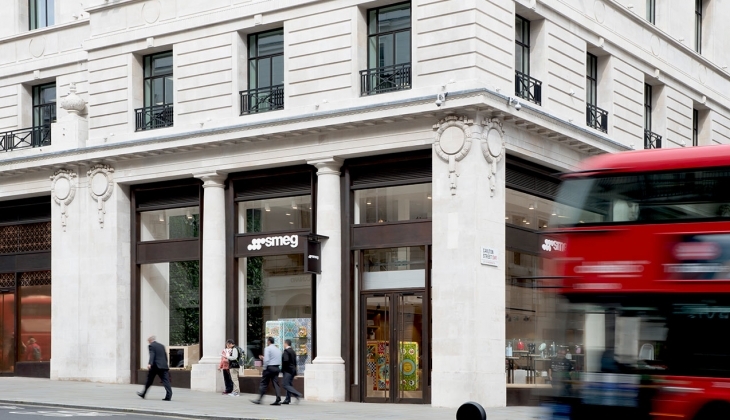 The space, a large cube format, has three floors with a surface area of over 600mq, and occupies the South-East face of the prestigious Crown Estate building at 14 Regent Street. 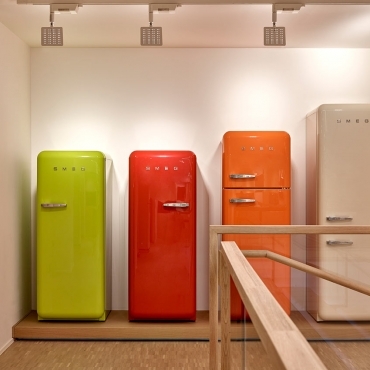 The fantastic showcase of appliances on display is enhanced by the light inside the building. 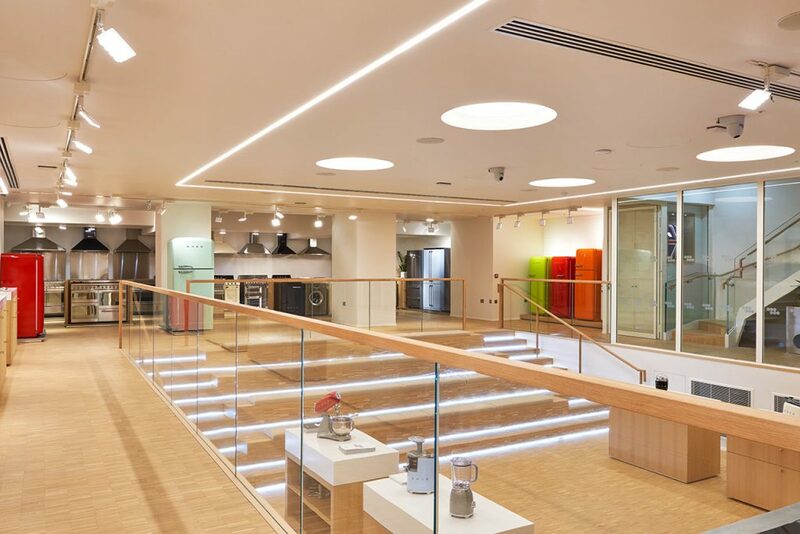 Light itself is a feature in the store as the windows are one of the largest in Europe. 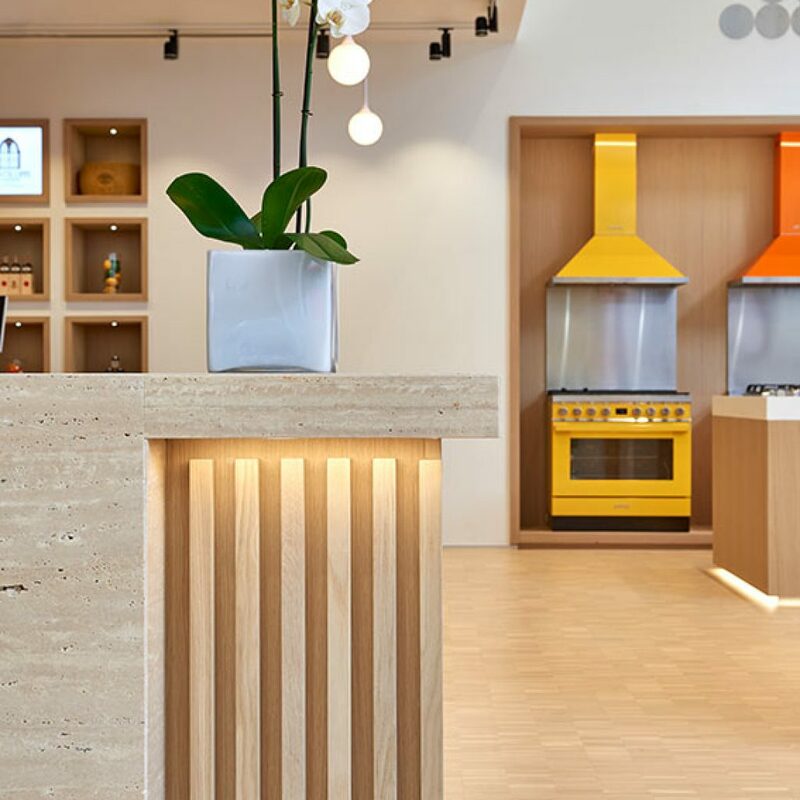 The design for this new architectural framework both reflects and renews the style which was first defined by deepdesign for Smeg in the Milan showroom. 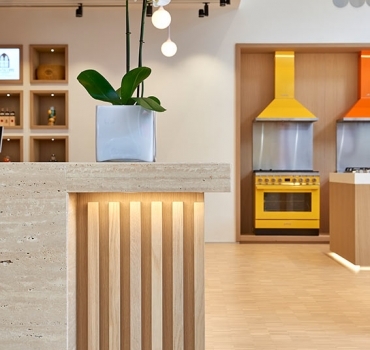 Architects Matteo Bazzicalupo and Raffaella Mangiarotti (deepdesign) – the designers of Smeg’s small appliances – have curated the overall design (both architectural and interior) of the new International flagship store along with Edoardo Radice. The interior architecture is minimalist, yet it feels welcoming and warm through the use of natural materials in stone and wood. The large windows make the building practically transparent, allowing the important double height cubed-shaped layout of the ground floor to be easily viewed from the outside on all fronts. It is architecturally characterised by the presence of a considerable mezzanine level which overhangs the large centrally-positioned counter. 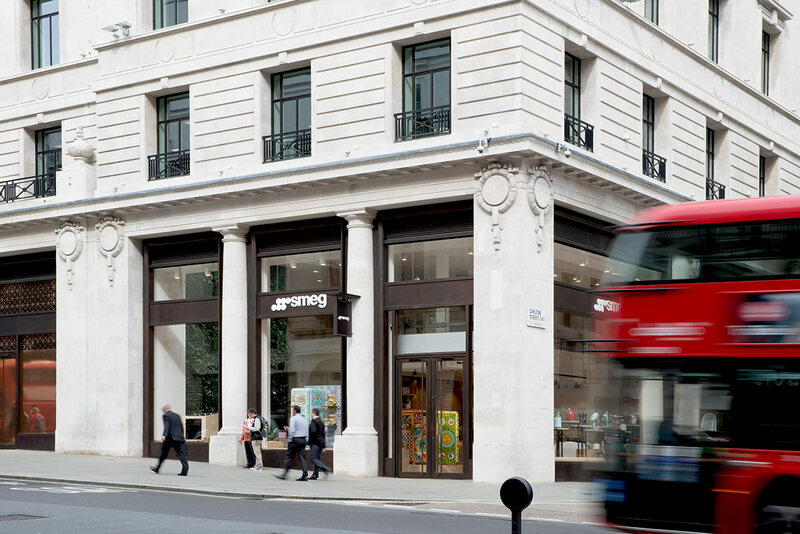 The finishes and furniture are made from Oak and Roman Travertine stone, semi-transparent walls constructed from slats in Oak or glass, and a magnificent 6mt vertical garden has been installed to the side of the first window nearest to Piccadilly. This incredible feature both amplifies and enhances the height perceived from the ground floor. 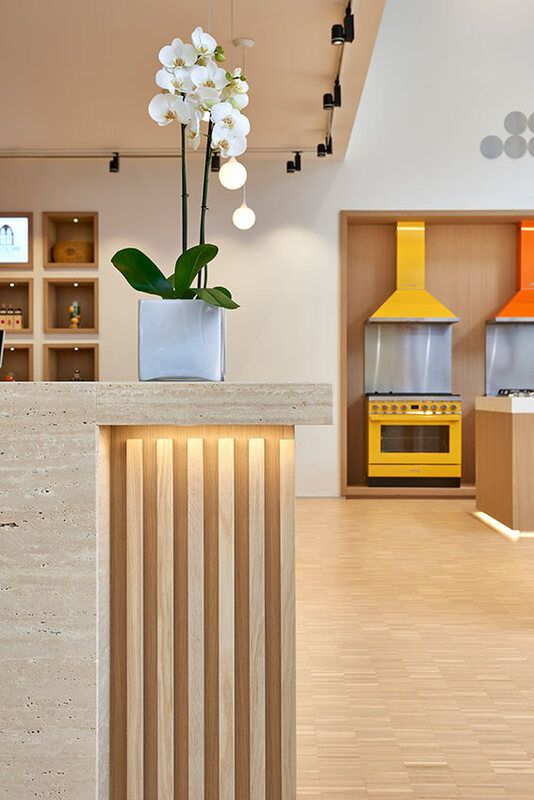 The products on display are elegantly displayed on a number of large minimalist modules finished in Travertine stone, glass, Carrara marble and wood. 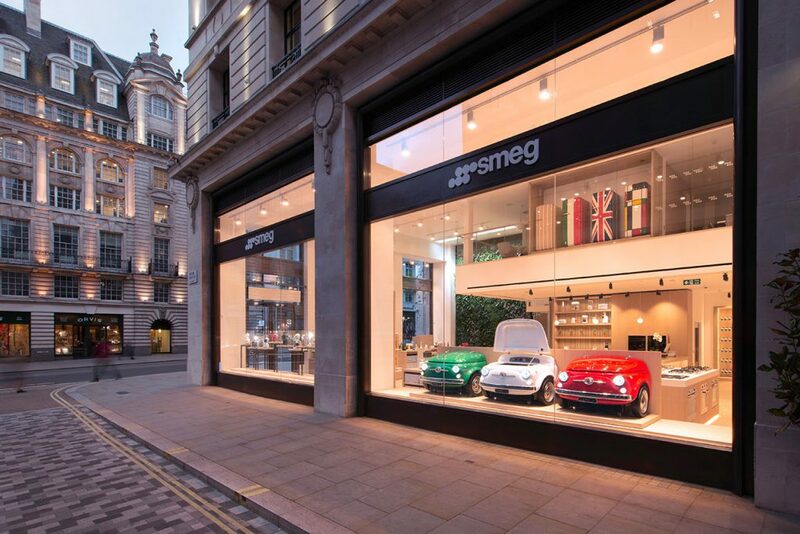 The immense windows facing Regent Street and Carlton Street glorify the precious interior, and focus attention on the elegance of the products on display – the real stars of the scene. 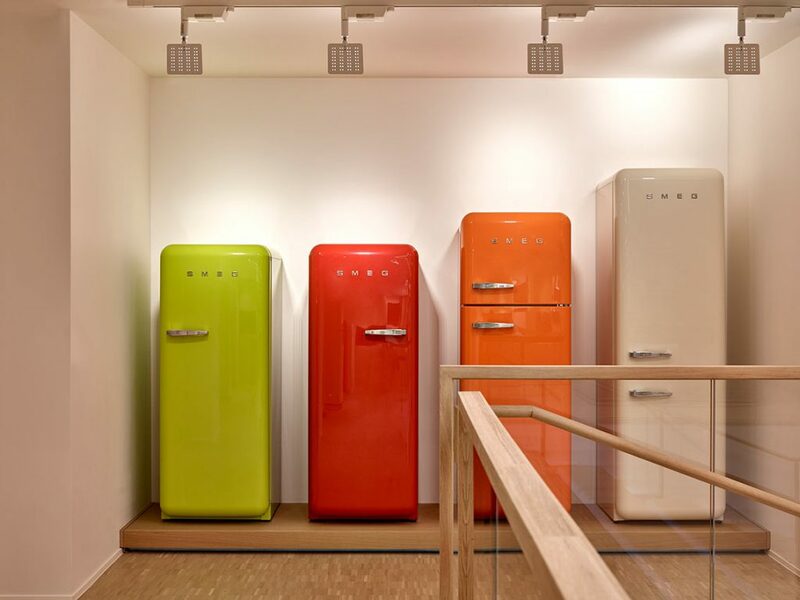 The most prominent products are presented in the windows – always with evermore creative displays and custom-made equipment – for example “i Frigoriferi d’arte” FAB28 refrigerators decorated by artists in collaboration with Dolce and Gabbana, or small appliances designed by deepdesign and decorated by Dolce and Gabbana, etc. 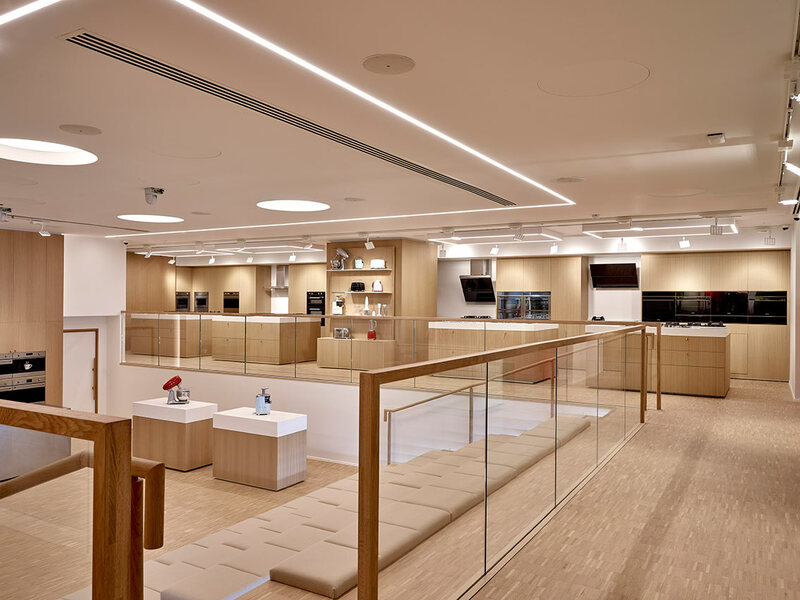 The mezzanine features a conference room with a full-height glass wall, and a lounge area for guests with views on two sides that look out over the entire showroom, as well as onto Regent Street and Carlton Street. 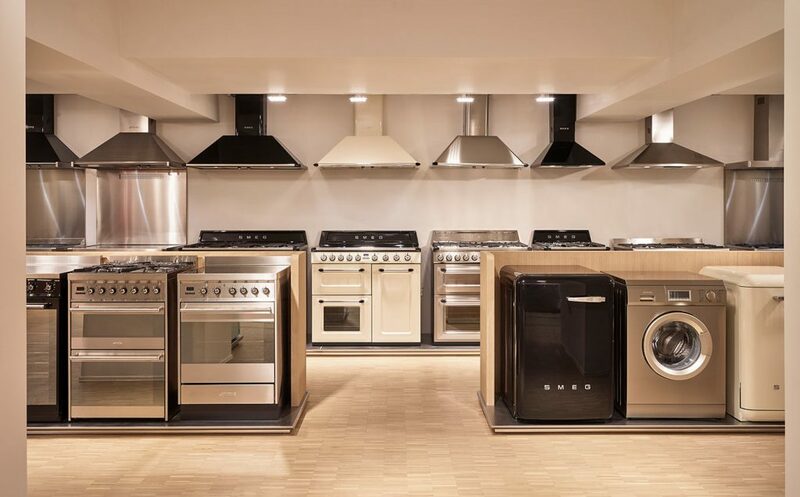 The vast array of models on display continues in the basement where there is an impressive built-in section with coordinating appliances, grand wood and Corian islands, and a large theatre complete with an imposing stainless steel demonstration kitchen where cooking shows and events will be held. 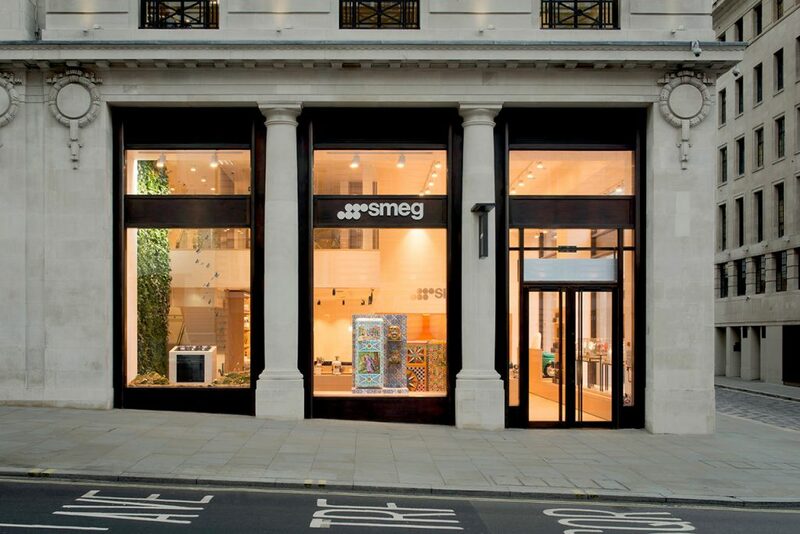 The counter area on the ground floor is also an important retail zone, the space is dedicated to the display of typical products from the Montecoppe dairy farm, traditional food that strengthens the Italian heritage of the Smeg brand. 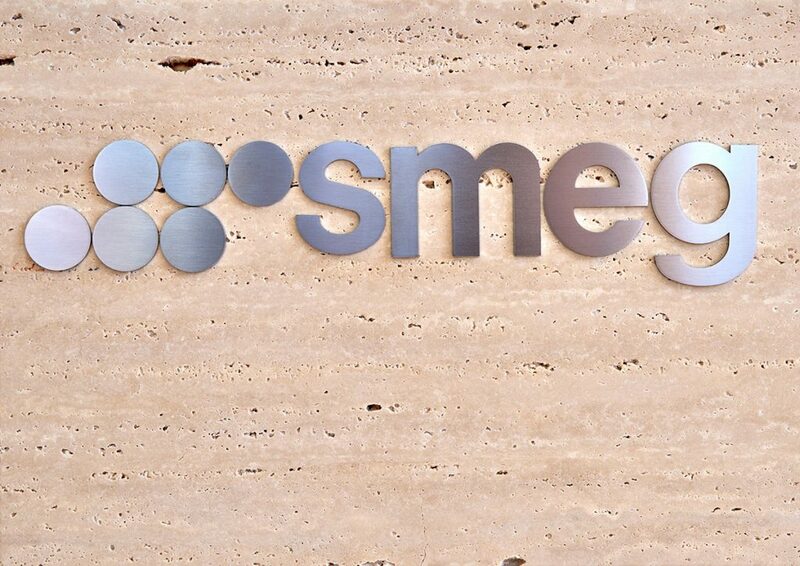 In this area the guests will have the pleasure of tasting the best Italian cheese and wines, and witness the world premiere of the new Smeg coffee, as well as enjoy citrus juices made with the new series of small appliances designed by deepdesign.